Will I lose my database after updating the Projetex Server? 2.Select "Server installation" in the drop-down list, and click the "do not install database" button on the "Select components" screen. 3.Answer Yes to question: "The folder C:\Program Files (x86)\AIT\Projetex 3D\Projetex Server already exists. Would you like to install to that folder anyway?" After installation is complete, go to the Corporate Settings page of the Projetex 3D Server Administrator. If the page is displayed without additional messages - no database update is necessary. 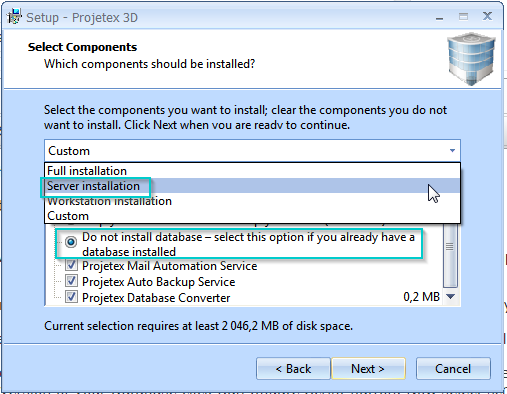 If you are prompted to update your database, please run the Projetex 3D Server Administrator and go to the Database page. In the Database Version field you can see your current Database Version. Click the Go Offline button. To upgrade the version of your Database click the Run Update Script button. Now select the script which you need. For example, if your current version is 157 and the program requires 158, you need to select dbx157to158.ptu, if your current version is 156 you need to select dbx156to157.ptu and then dbx157to158.ptu, until you have the required version of the Projetex Database.